One of the best ways of reducing crime is to make anti-social behavior more expensive. Simply stated, the goal is to alter the cost-benefit analysis of criminals. This doesn’t mean, by the way, that I’m assuming that bad guys are geniuses who put together spreadsheets or engage in elaborate calculations. Instead, I’m simply suggesting that crime becomes less attractive if thugs have a feeling that they’ll be more likely to get caught and/or more likely to get harsh punishment. And, as I explained in my IQ test for liberals and criminals, bad guys also will be less likely to commit crimes if they know there’s a non-trivial chance that they may get shot. I know that would change my cost-benefit analysis if I was a crook. But it’s not just my satirical IQ test. You get the same results from real experts such as John Lott and David Kopel. 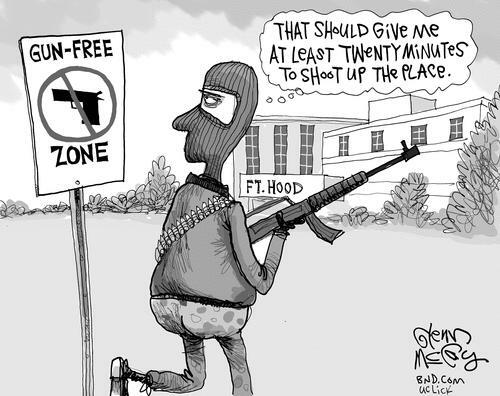 This is why there’s less crime when law-abiding people own guns (as humorously depicted here and here by Chuck Asay). Unfortunately, an army base is one place where bad guys can feel confident that they’ll find unarmed victims. This is worth discussing since, for the second time, we have a sad example of innocent – and disarmed – people getting killed at Fort Hood. Glenn McCoy has a cartoon that aptly summarizes this issue. I’m sure some statists would argue that both the cartoon and my analysis are wrong because the killers (Ivan Lopez earlier this month and Major Hasan back in 2009) were crazy and simply wanted to kill the maximum number of people. But experts have shown that even nutjobs engage in planning and figure out that they will have more ability to kill if they choose venues where potential victims are disarmed. And even if we hypothesize that some crazy people might be too unstable to make those calculations, what’s wrong with allowing people to carry weapons on a military base so they can defend themselves?!? But I’m not holding my breath expecting the ideologues in the Obama Administration to change their anti-Second Amendment policies. Though at least we can be happy that more and more states are acknowledging reality and expanding concealed-carry rights and implementing stand-your-ground laws. P.S. I’m increasingly optimistic that we are beating the statists on this issue. Honest leftists (see here and here) are acknowledging the value of private firearms ownership. We have very strong polling data from cops that gun control is misguided. And ordinary citizens would engage in massive civil disobedience (as we’re seeing in Connecticut) if the thugs in government tried to confiscate guns. P.P.S. But let’s not get complacent. Statists may be losing some battles, but they won’t give up in their war against the Constitution. And they’re using government schools to push a fanatical anti-gun agenda. And they’re also working through the United Nations in an effort to get gun control through the back door. Though I suppose we should be happy that American statists aren’t as crazy as their British counterparts. P.P.P.S. Let’s close with some gun control humor. If you want to know how leftists concoct data against gun ownership, here’s a good example. And here’s a video showing how leftists think about guns. Folks will also enjoy this comparison of how guns are viewed by liberals, conservatives, and Texans. And I think we can all agree that this driver is being very polite. People who want to ban guns lack common sense. And that is because you understand the REAL world, which is inhabited by good and bad people. It never ceases to amaze me how naive a lot of people are about the world. I guess it can be attributed to people who go from watching American Idol to playing video games, to texting their friends, day after day, after day, after day (endlessly). It also never ceases to amaze me what blind trust people place in the ability of police to instantly be there to rescue them when the bad guys (that they didn’t believe were there) come after them. I once asked someone what they would do if they saw a violent crime in progress. They responded that they would call the police. So I told him that if he saw a child being raped and the only thing he did was call the police, then that made him no better than the people who witnessed the Sandusky rapes of young boys at Penn State and who refused to at least attempt to stop it (there were at least two, on separate occasions. What kind of humans are these people and what drugs were their parents taking to produce such brain damaged children? Again, there are literally thousands of incidents every year in the U.S. where people have stopped great bodily injury or death to themselves by using a firearm against BAD PEOPLE. For every one of those instances, there are a dozen or more instances of where unarmed people stopped a bad guy with a gun, with less violence, less injury, and less loss of life. Use of a gun is, too often, the hard evidence that common sense and rational thought have failed. We should not encourage gunplay, but instead should work to achieve safety so that no one feels a need to carry a gun. Give us back the America of George Washington, of Abraham Lincoln, of U. S. Grant, of Theodore Roosevelt, when we regarded it as a triumph of our American system that people did NOT have to carry guns and be trained to use them. Again, there are literally thousands of incidents every year in the U.S. where people have stopped great bodily injury or death to themselves by using a firearm against BAD PEOPLE. You can look it up if you are interested inserious research, as opposed to the usual suspects of the MSM. Your problem is your refusal to accept the simple and demonstrably provable fact that there are BAD PEOPLE in the world who will do others harm, if they can. People who are blind to that fact always think that “gee, if we just didn’t have any guns, the world would be so much better. Denying reality is a very nice form of escapism, as long as reality does not intruded upon the pipe dream. I guess your main argument here is that if everyone had guns we would have some sort of wild west show where everyone is shooting each other. The reality is the ‘wild west’ was never that wild and the fact that you believe it was is another example of allowing escapism in the form of viewing movies has shaped your perception of what the reality was. I note that in the news today, deputy sheriffs somewhere in the U.S. shot and killed a man they thought was a hostage taker and shot and wounded another. In both case, the people shot were in fact, hostages escaping from their captor. This is just the latest example of a long line of police shooting the wrong person during an incident. I do not presumptively blame the police in these situations but I guess by your perspective we need to take the guns away from the police. Finally, when you indicate that my “preferred method of arming everybody” must be shown to be effective in stopping tyranny, your argument runs afoul of a little something called the U.S. Constitution. As I previously indicated in our discussion, if you wish to do away with the Second Amendment, then why stop there. What about free speech, what about the right to vote, what about the prohibition against slavery, etc.? The burden is on you to prove that we should not follow the Constitution, not me. I do not advocate that everyone be armed: I argue that everyone has the RIGHT to be armed and should be able to do so if they choose. It goes back to my preference for the freedom of choice we supposedly have in this country. One more thing here. You believe that voting is the way to fight tyranny. Tell that to the Iraqis who apparently voted 99% for Saddam Hussein. Tell it to the Russians who voted for Stalin in about the same numbers, or to the Bulgarians, the Poles, the Ukranians, the Albanians, the Czechs, the Yugoslavians who all voted for their ‘leaders’ in the 50s and 60s in about the same numbers. There are literally hundreds of other examples of where the ‘ballot box’ is just ‘window dressing’ for a dictator; lipstick on a pig, so to speak. Actually, one more thing (this time I really mean it). I enjoy discussing these and other issues with serious individuals who also enjoy it. This serious stuff that is the subject of our discussion has to be resolved and soon. It is not my intention to ‘win’ an argument since there is no winning in this context. If I come across as overly sarcastic or pedantic, it is a failure to communicate effectively on my part (although I should be given SOME artistic license). If you want to talk about information as a weapon against tyranny, perhaps you can explain how information would have stopped Germany in 1939, or the British in 1776, or the Russians in Afghanistan in the 1980s, or for that matter, the Iranian government in 2009, when students were leading an uprising there. How about you explain why private gun ownership didn’t stop any of those incidents? You claim we need a lot of guns in closets and nightstands to stop such tyranny — but in each of those cases, there were plenty of such guns out in the population. Tyranny won. A good militia prevents tyrants who invade. Ballots prevent tyranny from within. Arming everybody means a lot of people will die from accidents, suicide and homicide — but it does not mean tyranny will be stopped. It’s your test. Your preferred method of arming everybody can’t pass it. So I imagine you are not a big fan of the book ‘1984’, ‘Brave New World’ etc. Thats OK, some of us do value security over freedom (many Americans have the same perspective as you). If you want to talk about information as a weapon against tyranny, perhaps you can explain how information would have stopped Germany in 1939, or the British in 1776, or the Russians in Afghanistan in the 1980s, or for that matter, the Iranian government in 2009, when students were leading an uprising there. But all that is on the macro level. It is even more significant on a micro level. You talk about having information, then perhaps you might research objective findings about how many lives are saved in the U.S. with guns, how many rapes are prevented with guns, how many of a myriad number of crimes are prevented with guns. You know, its funny, it is right in front of you and yet you cannot see it. Fort Hood was attacked once in 09, when anyone with a firearm could have saved a number of the people who lost their lives because of some bizarre policy that those who can be trusted with automatic weapons off a military base cannot be trusted with a semi-automatic weapon on a military base. But then the most unforgivable sin was when the policy was continued and now other good soldiers have died, when again, one person with a weapon would have stopped this garbage. The people who continued this policy are DIRECTLY responsible for the deaths and injuries that occurred at Fort Hood this year. If they were a private business, the people who created this idiocy would be sued since they already had notice that this was a hazardous situation and yet they did nothing. They could freaking care LESS about the soldiers and their families. To them, the soldiers are just so much fodder that do not matter to the IMPORTANT people of the world. You want peace, you will NEVER have it as long as you believe that there are no longer any villains in this world. I do notice that those who most strongly advocate disarming of the People, such as Bloomberg, obama & holder have myriad number of armed security guards around them. If they truly believed all that they say, then theoretically, why would they need people with guns, since those people with guns (their guards), might mistakenly shoot innocent people during a gun battle. The truth is, they care as little about the American citizens as they do the soldiers who died at Fort Hood. By the way, I don’t advocate revolution against the U.S. government, any more than you advocate the abolition of the U.S. Constitution (but then again, maybe I assume too much). Actually, tyranny is more often stopped with good information. Guns were NOT taken from people in all the Eastern Bloc nations, nor even most of them. Reality is that personal arms don’t hold up well against an organized army with tanks and more automatic weapons. Our not being invaded has nothing to do with people in the U.S. owning arms — the reality is we’ve lost more people to accidental death and homicide with guns than we lose in wars. What’s the point of that? Mention of holding on to guns to stop tyranny. You and I both know that’s code for “I’m going to arm myself against the U.S. government.” Wholly apart from the fact that the Constitution defines that as treason, we’ve not had tyrants in the U.S. where personal arms were useful; we’ve not had tyrants in the U.S. EXCEPT, our entire nation is held under the tyrannous rule of gun violence. Mass shootings in schools, in workplaces, at sporting events . . . what is the definition of terrorism, again? Worse, much of the time those shootings are done with legally purchased and legally owned guns. Our swords are sharp. But so are the unnecessary swords of too many yahoos. The point of keeping your sword sharp is not having to use it. When does protecting our children, and our democratic institutions, take precedence? Takers. Wow, soooo judgemental! In the real world, violence is stopped when the good guys are stronger than the bad guys, something a lot of Americans don’t quite seem to comprehend. If you wish to learn about the real world, ask people from Eastern Europe about what happens when the personal possession of firearms is prohibited. I attribute American naiveté in this regard to the fact that the U.S. has not been invaded in over 150 years, something which not too many other countries can claim. So we don’t know what oppression is, we wouldn’t know it if it was staring us right in the face. There is an old Chinese saying which roughly says “if you want peace, keep your sword sharp’. There will ALWAYS be those that wish to oppress other people, whether they be the mugger on the street, the shooter in the theater, the generalissimo in some South American country, or some mustached little twerp who was born in Austria. I don’t have any problem with your belief (since I am, by nature, a libertarian). I would just question your lack of awareness as to human nature. So, you refuse to take any steps to decrease violence until someone waves a magic wand and cures all problems? Too much work for you takers, I presume? Generally, yeah, it’s dumb to rob anyone. Period. Robbers still do it. Generally, it’s dumb to rob somebody who is armed, or who may be. Despite it’s being dumb, robbers do it. They are called “armored cars” because they are armored against robbers, and the guards are armed and trained to shoot robbers. Still, armored cars get robbed. It’s a funny line to say that robbers don’t rob gun stores, but robbers are either too stupid to get the punchline, or think they can be the exception. The second case I offered above, the robber used a HAMMER to holdup a gun store. Classic robbery. Gun store lost (robber was caught). If you think shooters go where people are unlikely to have guns, that’s just not so. The Columbine shooters got past an armed deputy sheriff. Robbers, and people bent on murder and mayhem, benefit from access to weaponry more than they benefit from unarmed opponents. Robbers go for the money. Crazy people go for . . . God knows, but the presence of arms doesn’t deter them. Here in Dallas we still mourn the death of Chris Kyle, the nation’s deadliest sniper — who was shot to death, while armed, at a shooting range. The shooter walked away. All too often, the shooters ASSUME they will be wounded or killed by others. They work on surprise, and the knowledge that, with weapons, they can injure a lot of people before they go down. A plethora of guns has not produced decreased numbers of gun murders, gun crimes, or gun deaths, in the U.S. Never has. Throw that broken record out, and let’s talk about reducing violence, and cutting the deadliness of violence if and when it occurs. THAT works. For every school shooting (or knifing — see yesterday at Franklin High near Pittsburgh) — there are two dozen or four dozen cases where someone WITHOUT A GUN intervened to stop the incident earlier. Too may people seem blinded by the power of guns, exactly as are the perpetrators of violence and death. The presence of guns appears not to deter violence, not by any statistical measure. Statistics show that where there are many guns, accidents, suicides and murders are all multiplied. Increasing the number of guns is MORE LIKELY to offer access to someone bent on destruction, mayhem and death, than it is to stop or slow gun violence of any kind. Civilization should mean an end of violence, not the spreading of violence to every transaction. George Washington didn’t fight for a right to carry a sidearm to the local tavern — he didn’t carry a sidearm. The founders who gave us the Second Amendment would be shocked by the violence, death and injury wrought in its name. They were worried about genuine tyranny without any say in government. Tyranny doesn’t always imply violence, but with cheap and readily available guns, tyranny more and more involves arms. When everyone is armed, tyranny is not held at bay. The society drowns in it. I guess you don’t quite get my point. In both of those incidents, the crime was burglary, not robbery. Burglary occurs when someone breaks into your house or store and steals things, frequently when no one is at home. A robbery occurs when someone sticks a gun in your face (or a knife, anything that threatens your life and takes things. In both incidents that you cite, the crime occurred when no one was around (3AM, early Sunday morning etc). The intuitive usefulness of having armed people around who can defend themselves against an armed assault presupposes that those people are, in fact, around. If you wish to compare a robbery to a burglary, think of the Aurora Colorado theater shooter breaking into a theater at 4AM and starting to shoot up an empty theater, before he takes the candy from the snack stand. Obviously nonsensical, but that is a valid comparison of the public safety difference between a robbery and a burglary. Hand guns were stolen, almost exclusively. Reblogged this on Tea Party — One Lump or Two?. I keep repeating this. When was the last time a gun store was robbed? I have a feeling it happens very infrequently, despite the fact that a gun store has something which is VERY valuable to criminals, GUNS! Figures out this past week show about 25% of recruits to the Army have previous episodes or a history of mental issues. At Fort Hood, there have been two mass shootings in five years. You think arming everybody will DECREASE the shootings? There is no indication of any nature that people packing private arms on a military base reduces shootings.